While Community Food Rescue’s primary focus is to rescue and redirect good food to people, we support EPA’s food pyramid so that food that is unfit for human consumption goes to animals and food scraps are processed into compost. Montgomery County has an ambitious goal to recycle 70% of its solid waste by the year 2020. The largest component of all solid waste is food waste, comprising 146,000 tons (23%) per year. Food not fit for humans is great for livestock and compost. To reduce food waste and achieve this goal, the county seeks a private company to operate a processing facility to compost food waste. The facility would start with commercial sector food waste processing 20,000 tons per year and then ramp up by adding a single-family curbside collection program, processing an additional 10,000 tons per year. 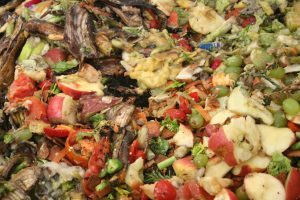 This is very exciting news following on the heels of Council member Roger Berliner’s introducing Montgomery County Bill 28-16, which would create a Strategic Plan to Advance Composting and Food Waste Diversion. CFR supports the bill and provided public testimony last July along with many other supporters. The bill is moving through the legislative process with a Council work session scheduled on October 27th. While this municipal initiative winds its way through our county government, CFR mini-grant recipient, growingSOUL, has taken a high-tech approach to small-scale food scrap composting. The non-profit’s mission is to help community members connect to one another and our earth, and in the process of growing food, help grow our SOULs. The organization’s programs seek to create zero waste food systems through Yardlink– small-scale gardening and composting with low carbon footprints. Through Putting Stock in Your Community, they recover, process, preserve, and recycle food into soup stock, jams, salsa, fruit leather, and other value-added foods. Their diverse, multi-generational corps of volunteers engage hands-on, becoming lifelong learners, connectors and part of growing a movement, not apart from it. 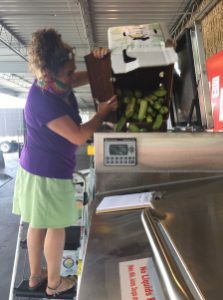 Currently, growingSOUL triages and redistributes 10,000 pounds of food per month in Montgomery County fromCooseman’s Produce, a large distributer located in Jessup, Maryland. Two thousand pounds is donated as whole produce to CFR food assistance organizations, including Manna Food Center and Rainbow Community Development Center. The remaining produce that is too bruised to eat fresh is either processed into growingSOUL’s branded food for sale and donation, or composted in growingSOUL’s new BIOGAS digester (provided by a grant from Montgomery County). About 1,400 lbs. of inedible produce is reduced by 90% within 24 hrs. 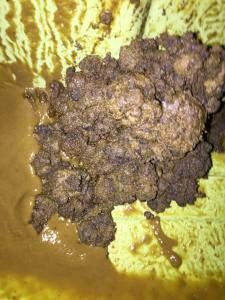 It takes a lot of trial and error adjusting the mix of produce, temperature, agitation, and heating time to achieve the perfect slurry. More trial and error adjusting the time and temperature in the radiator to get the water out, but not scorch it. The end product is a digestate that can be used to feed animals or to use as a soil amendment. 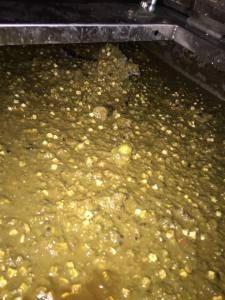 The end product from the digester will be fed to farm animals and pets as well as growingSOUL’s vermicompost (worm) systems at Sherwood High School and at Pogo’s Organics in Brookeville. Cooseman’s is just one of many food distributors located at the Maryland Food Center Authority (MFCA). Jessica explains, “Our goal is to utilize the CFR mini-grant funds to help expand food redistribution and composting within the entire MFCA distribution center which is estimated to be 10,000 pounds per week.” That’s a lot of compost!